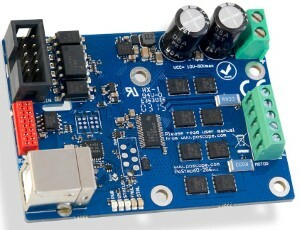 Here is a standalone stepping motor driver that is rated at 2.5 peak amps per phase. 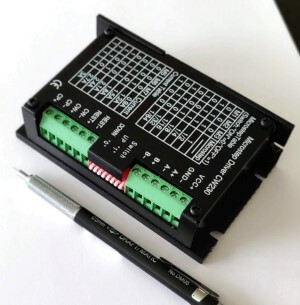 The driver will also accept a range of 8.2 to 45 volts and can be microstepped up to 1/32 (the step modes are: full, 1/2, 1/4, 1/8, 1/6 and 1/32). 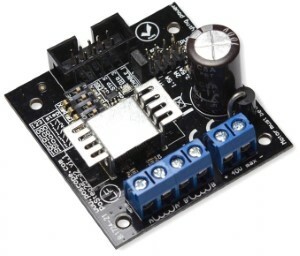 This stepping motor driver plugs conveniently into the 3D Printer main board. No cables from the main board to this board is necessary. The circuit is very straight-forward. There are two typical components in the functionality of the circuit: The translator (L297) and the Driver/Amplifier (L6203). The translator receives step pulses and direction signals and "translates" the step pulses to coil combination signals and the direction signals is used also to determine how the coil combinations are sent. The coil combination signals are then sent to the L6203s. There are two L6203s for each L297, since each L6203 drives a single coil. A new driver based on the A3979 chip is in development. The A3979 is a tough chip to use since it needs ample and large contiguous copper surface area for heat dissipation. The great aspects of this driver chip is the integrated translator, the power for 2.5 amps per phase, and the ability to set to 1/16 microstepping. This driver requires less peripheral circuitry and may allow me to put three drivers on one board. I am also planning on making a small driver board if another 4th axis, or 4th motor is needed. Another reason this driver chip is used is that the cost is low and I don't need a microcontroller sending out PWM (pulse width modulation) to the vref of other non integrated drivers to get the 1/16 microstepping. The board and schematic will be available for download. I would recommend this project for the advanced level hobbyists. This is the PoStep25-32 with a 0.5 to 2.5 Amps Phase Current. Are your chips or voltage regulators getting too hot? Consider these small heat sinks to remove all that thermal energy!